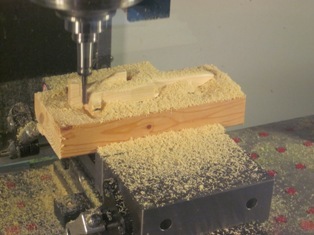 What could be more fun than a Saturday family activity in the CNC shop designing, programming and machining Cub Scout Pinewood Derby cars? CNC Teachers from Wisconsin, California and Indiana completed the unique, hybrid online/onsite Vincennes University Mastercam Mill Certification class. The course combines the best of both worlds, 60 hours of online Mastercam University Mill Design and Toolpath training, plus three days of onsite training and testing, including CNC machining time on the Haas machining centers. The course focuses on taking the mystery out of working with WCS's, Constuction planes, and Tool planes. It also emphasizes how to organize and work with toolpath groups, and of course how to generate, post-process and r . . . The November 15 Renishaw Ballbar Test Training class was attended by 6 people from industry and 2 from post-secondary education. States represented included Ohio, New York, and Wisconsin. The class was team taught by Andrew Bailey of Renishaw and Doug Bowman, VU HTEC Director. The course focused on the QC20-W ballbar and volumetric testing (XY, XZ, YZ planes), utilized 4 Renishaw ballbars and 4 Haas vertical CNC machining centers as shown in the pictures. Participants were anxious to get back and put their ballbar testing skills to use on their CNC machines. Another CNC Milling Programming, Setup and Operations class is in the books. All of the participants passed the performance portion of the test, and are now eligible, pending Met-Tec committee review, to take the theory test for the NIMS credential. The hands-on training gives you so much confidence. Almost right after the handshakes and the introductions, you are at your own machine learning one-on-one and in small groups. The instructor is a veteran shop professor. Very organized. He is qualified to teach . . .
Another 'Art of Machining Titanium' class is in the books. Peter Bowman, Manufacturing Engineer at Flying-S Aerospace was the guest presenter. 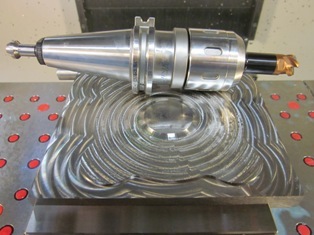 The Sandviik 316 high feed endmill was high lighted, along with Mastercam's new high speed machining toolpaths, and the Technik's milling chuck tool holder. The Haas VM-3 CNC Machining Center was used for the demonstrations. ABB Robotics hosted their annual Technology Days at the ABB Tech Center in Auburn Hills, Michigan October 11 -13, 2011. This event is a showcase for ABB and it's partners to demonstrate the latest in manufacturing technology. Vincennes University's ABB Training Center Director Scott Brown, and HTEC Director Doug Bowman demonstrated the CNC - robotic work cell that they designed and assembled over the past couple of months. The two machines were shipped up to Auburn Hills, which is just north of Detroit, just prior to the show. The work cell was one of many excellent live displays that were . . .